We offer the broadest range of artistic styles to suit any taste and decor. 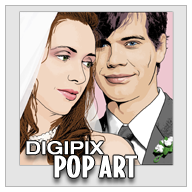 DigiPix Pop, a fun and colorful style, is inspired by the American Pop Art movement of the 1950's and 1960's. Like the artists of that era, our artists utilize a unique blend of fine art training and modern technology. We looked to three pioneer Pop Artists for inspiration when we developed DigiPop. The first is Andy Warhol, we incorporate his bold use of color and unique experimentation of printing techniques. Second, Peter Max who is a master at combining a variety of mediums to get a finished piece of art. Like Max, our artists combine a variety of today's artistic mediums to create your DigiPop. Finally we apply the fine line work of Roy Lichtenstein's Pop to your picture by hand drawing them onto the file. DigiPop comes in variety of combinations: 1 Panel, 2 Panel, 3 Panel, 4 Panel, 5 Panel, 6 Panel and 9 Panel. We also offer you a choice of color pallets: Pure Pop, Pastels, Tropical, Earthy, Sea Shore, Ice Creams, Neutrals and Grey Tones. 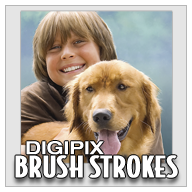 We are also happy to customize your DigiPix Pop colors. 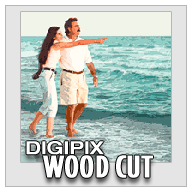 Turn your photo into a beautiful rich custom oil style painting. This fine art painting style combines your photo with our expertise in image enhancement, color manipulation and individual brush strokes applied by hand to the art work file. Our painters are classically trained in the fine arts and masters of the most current digital artistic mediums. Oil painting is a classic artistic medium dating back hundreds of years. Our artists are knowledgeable about different artistic styles. From Classical Realism with crisp, formal brushstrokes to Impressionism with broad loose interpretive brush strokes or somewhere in between, our artists can paint your artwork in the style of your choosing. As we said in our “How to choose a Photo” section some artwork styles are more forgiving of less than perfect photography and certainly our Brush Strokes style can help turn a less than perfect photo into a vibrant work of art. Dramatic and realistic, black and white sketch style brings out the fine details of your photo. 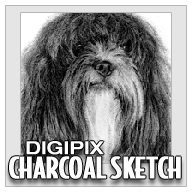 Our artists apply a series of photographic special effects to your photo resulting in a piece of art that has the look and feel of a charcoal sketch. Details are added by hand to the final file. Charcoal is one of the oldest mediums used by artists and we continue this tradition but give it a modern up to date feel. Woodcut is a fun and funky style that also has its roots in classic art. Wood Cut was the primary process for printing images for hundreds of years. It originated in China in the 10th century. It was originally limited to 1 color printing, using multiple colors was invented in Germany in the 16th century. The Japanese then developed an art form that is still used today. Our artists, inspired by the Japanese art form, have developed a technique of applying a series of photographic special effects to your photo, providing you with a contemporary interpretation of Japanese woodcut style. If you aren’t sure which style would work best with your photo and style contact us and we can help you with styles, color and size. We’ll work with you from start to finish.